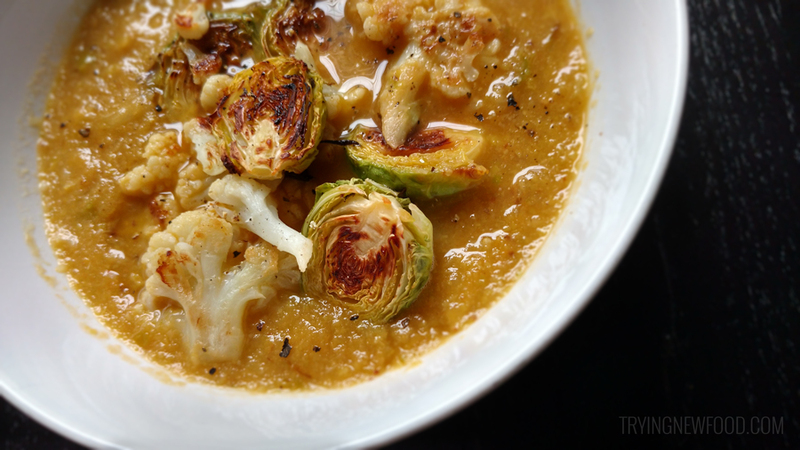 I have the unpopular opinion that Brussels sprouts are awesome, so I was really looking forward to this recipe. My husband was also eager to make this recipe since he loves soup. It turned out beautiful-looking and delicious! It wasn’t too heavy, but was filling enough that I wasn’t still hungry after finishing my bowl. Preheat the oven to 450° F, then prep baking sheet with aluminum foil and spray with cooking spray. Empty the bag of frozen cauliflower florets into a colander and run under cold water for a few minutes. Pat dry with a paper towel. Melt butter in a large saucepan on low heat. Add shallots and cook until they are translucent for about 5 minutes, then add veggie broth and simmer for 5 minutes. Make sure 1 cup of roasted veggies is set aside. 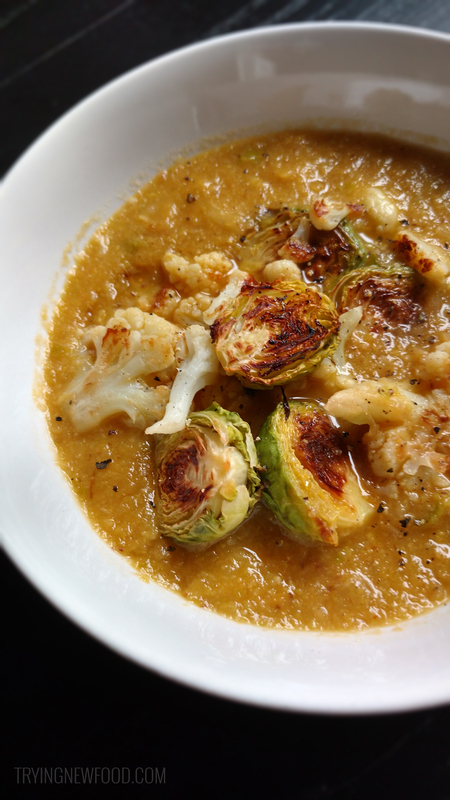 Take the remaining roasted veggies and add to the large saucepan and simmer for 2 minutes. We used our immersion blender and blended up the soup until it was the consistency we like. (Another option is to follow Gina’s instructions and transfer in 2 batches to a blender and blend until smooth.) Add in the salt and stir. Makes 4 bowls of soup. Top with the roasted vegetables and add fresh black pepper to the top. For Gina’s original recipe and instructions, please check out the original recipe here, and make sure to look at all her other recipes as well. We’re always checking her blog for new recipes to try. We really appreciate how she makes healthy recipes taste delicious.